Whoa, I'm sorry about that, but I was just competing in the latest and greatest form of extreme sport, driving with the window down. 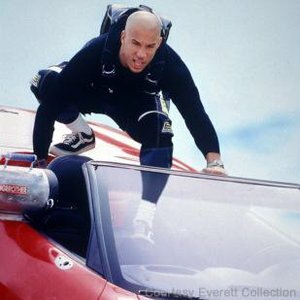 You'll note Vin Diesel has the window rolled down. I realize the extremeness of this endeavor ranks right up there with basejumping and walking on the surface of Mars (minus the cartoonish bug-eyed effect). It's something few people do, but it's also something I absolutely love an extreme amount. In this day and age of air conditioning and windows that actually close, this act is truly something extreme. But it's not extreme if you merely open up the window and let the air flow in, that's only partial extreme—akin to letting a cool breeze hit you. To amp it up, the entire head should jut out the window. Not only the entire head, but the neck and several of your extremities (hence the name0. You should irreparably alter the aerodynamics of your car. Only then have you embraced the extreme nature of this sport. There are the naysayers out there, the ones who say as long as you're not MMA fighting with a shark, you're not extreme. Well, let me just point out that the MMA Octogon exists outside of a body of water, the shark's place of life, so really all that would accomplish is beating up a hunk of dead fish meat. That ain't extreme. But window opening sure is. Did I mention bugs can fly up your nose? Really this whole thing is like skydiving, but you're going horizontal, and you're just as likely to black out, and you're not strapped to a burly man, and you can bring one of your cats along. Aside from those slight differences, driving with the window down is a totally accessible thrill sport. Take that Three-Legged Race! Just think of the life-threatening obstacles you encounter. Anyone who has spent any amount of time with their head out the window knows that a 20-minute rush will eventually cause a weird facial throb in forehead veins. There's also, of course, the problem of getting your head sliced off by a “No Txt N Drv LOL >:-|” warning sign. However, the latter problem usually solves the former. To participate in this sport, you can't just hop in a car all willy nilly and lower the window and suddenly claim extremity. Any seasoned Window-er knows it just does not work like that. The vehicle needs to be in motion! Although once fully engaged with engine turning goodness, you're pretty much set (you already rolled down the window). You can even do some extreme mods to totally amp up the extremity. Obviously Windowing gets its notoriety from the lack of stuff between you and air. Feel free to open up that sunroof, remove the windshield, add those wind tunnel turbines on the front, or push that one footy thing closer to the floor. When you combine all of these elements, you just might surpass hunting man for sport on the level extreme. Just don't wear a helmet, you'll just look goofy. And, by definition, goofy is not extreme. But I am extreme, my driving style proves it. So keep on rocking that car ride, but make sure you do it with that window locked down! Now pardon me while I VROOOOM VROOOOOOOOOOOOOM away.